Gain a clear understanding of the context in which the organisation or community finds itself and the challenges it faces. Identify the main indicators which can be used to measure progress made in facing these challenges. Assess the overall message of these indicators and thereby assess the current sustainability of the organisation or community. Consider the current challenges, make scenarios of possible undesirable and desirable futures. Assess progress made in either achieving or remaining clear of these futures in the light of current challenges. Imagine requires the organisation to invest in no additional capital assets such as software or personnel. 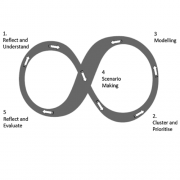 It is a facilitated workshop process in which a series of tools are applied to enable local decision makers to map their own context and model sustainable futures. In a series of four half day Imagine events, stakeholders from within the organisation or community come together with a facilitator to engage in the process. Imagine is Rapid, Participatory and Holistic It provides organisations and communities with empowering, evidence-based information … helping them to gain a clear insight into a sustainable future. Rich Pictures (such as seen at the top of the page) are used to map the initial context and amoeba diagrams provide an overview of how things were, are and (importantly) could be. Imagine is not Expert driven, Top down or Exclusive and full of technical language.